The CrossFit Community spoke and Reebok listened. The enhanced result is one of the best training shoes on the market. The Reebok CrossFit Nano 7 Weave has evolved from a commitment to excellence and the constant striving for top quality performance. All CrossFit shoes have a difficult role to fill. They have to be stable enough to support you when lifting, cushioned for running and tough enough to provide excellence under the harshest of conditions. They must be effective for specialised movements, yet able to improve any athlete’s performance across a wide variety of different exercises. Like great CrossFit Athletes, if they move too far in one direction then they may lose ability in others. Balance is the key. With that in mind, lets look at the stylish Reebok CrossFit Nano 7 Weave. 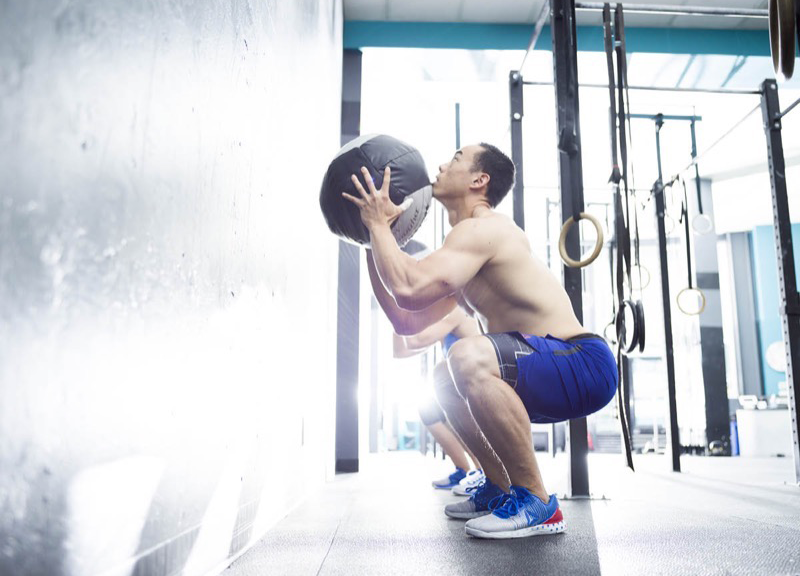 Although the Nano 7.0 was a great shoe for lifting and improved many features of the Nano 6.0, some Crossfitters found that the upper was too stiff for running and longer WODs. 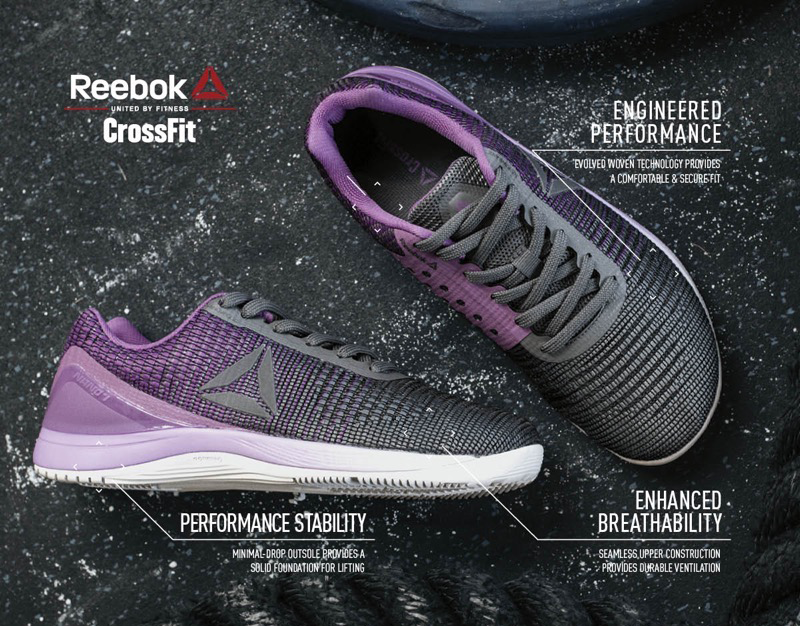 With this in mind, the designers at Reebok responded with a CrossFit shoe that is highly adaptable and stable, yet effective and comfortable for running and responsive movements. The new weave upper has been engineered into a single seamless piece of material. This provides more flexibility across the entire foot without any loss of support for lifting. The combination of a mesh upper and weave, alongside more room in the toe box creates a much more flexible shoe and an improved feeling of comfort. The tongue and ankle collaring have more cushioning as well, which is especially useful for lifting and endurance WODs involving multiple different movements. A reflective logo has also been added as an extra detail. I try to not do the sales pitch unless I really like something and I think it has value. The Nano 7 weave is available today. I really like this shoe and how much the flexibility and overall feel has been improved from its predecessor. 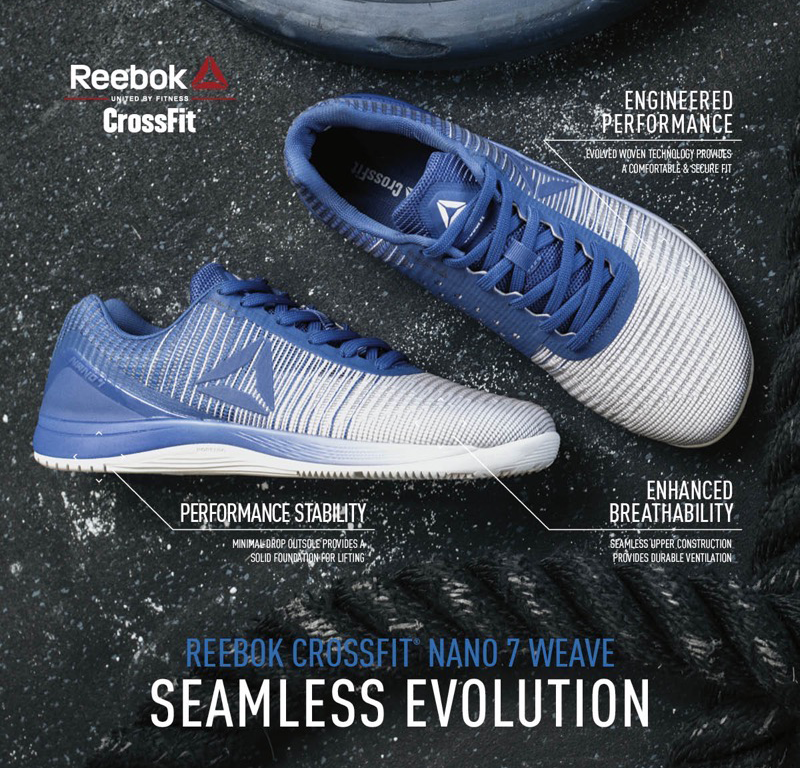 With the Reebok CrossFit Nano 7 Weave, the direction of the fibre weave has been changed. This works in accordance with the natural movements of your foot and the way that it stretches, allowing for enhanced flexibility and movement. I found this upgrade especially useful for movements such as bar facing burpees and box jumps when I needed to be quick on my feet. Another advantage of the seamless upper construction is that it provides ventilation. As the Reebok CrossFit Nano 7 Weave are more breathable, they keep your feet cool and stop any overheating, especially when you train in warm conditions. The minimal drop outsole provides a solid foundation for lifting. At only 4mm you feel lower to the ground, which is great for weightlifting and powerlifting exercises. The combination of the rigidity of the Nano shell midsole wrap, the midsole and the outsole make for an incredibly stable platform. 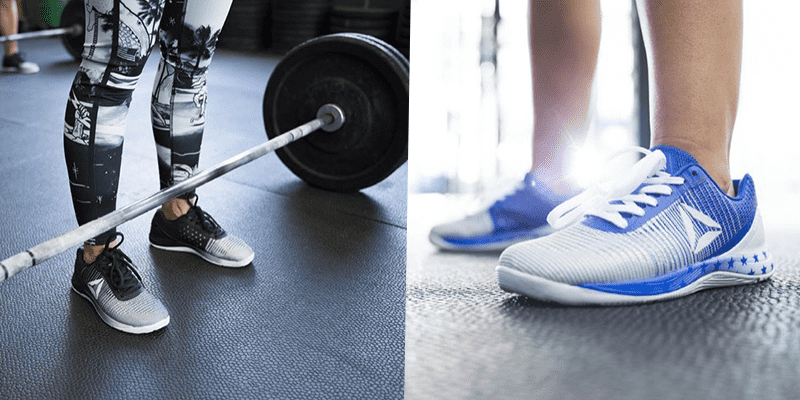 Aside from Oly lifting shoes, these are some of the best training shoes for lifting, which we all know is essential for the vast majority of CrossFit workouts. I experienced no heel slippage lifting in the Reebok CrossFit Nano 7 Weave. The flexibility from the weave upper made jerks and snatches feel responsive yet stable. Personally I don’t believe in always lifting in Oly shoes, as they can mask weaknesses in ankle mobility, so for me this is a very important point and the Nano 7 Weave did not disappoint in this area of performance. The Reebok Crossfit Nano 7 Weave are exceptionally grippy shoes and perform well during rope climbs. This is due to a slightly different rope guard on the medial portion of the shoe and the fact that Reebok work closely with their athletes to create designs and use materials that are tested and retested by the top names in CrossFit. 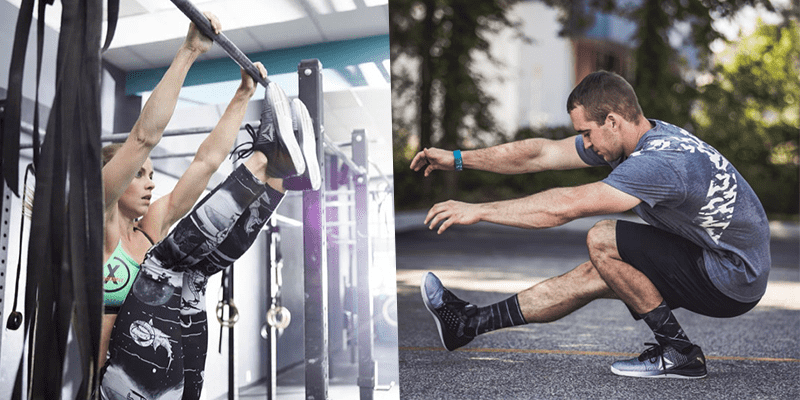 From Katrin Davidsdottir to Rich Froning, these training shoes have been forged and tested by the best in the game. This rigorous process and attention to details and subtleties helps to ensure the highest quality possible. The sole is the same as the Nano 7.0, but as this was one of the standout quality attributes of the original model, there really was no need to alter this at all. Midweek Motivation. #YoureWelcome #BeMoreHuman #DreamBig #NewMonth #NewGoals Repost: @katrintanja AIM HIGH AND KEEP YOUR FEET ON THE GROUND IN PURSUIT OF IT ???? The toe box is slightly wider that the Nano 7, but not as wide as The Reebok CrossFit Speed TR. With the general fit, they follow a pattern that has emerged from the evolution of The Nano. The Nano 3.0 was wider than the Nano 4.0, the Nano 5.0 was wider than the Nano 6.0 and the new weave is now wider than the original Nano 7.0. They are also much more comfortable right out of the box. All training shoes require a period of time to break them in but the Reebok CrossFit Nano 7 Weave felt good right after they had been unboxed. The additional cushioning on the tongue and ankle collaring helped to make them feel snug and supportive. The seamless one-piece upper creates a much better looking shoe. The weave itself also allows for a bold gradient to spread across the shoe and create striking results. Whether your style is clean and minimal or bold and bright, these will keep you looking fresh when you train, compete and win.